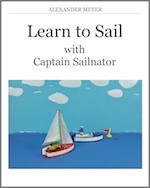 Many of the people who learn to sail have the dream to live aboard a sailboat one day or even to sail the world. But how can this dream become reality? One way is to ask people who already did it and learn from their experiences! Captain Sailnator: Hello Laura and Chuck. Thank you very much for taking the time to answer my questions and to introduce yourself to my readers. 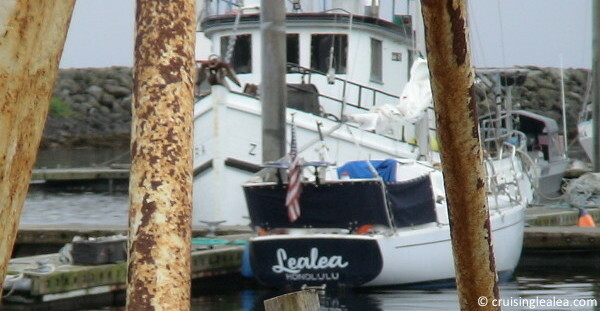 First I would like to ask: What kind of boat ist LeaLea? Laura: Lealea is an Albin Vega 27, hull#1860 of approximately 3500 built in Kristinehamn, Sweden by Albin Marin AB between 1969 and 1975. She was first sold new in Honolulu, Hawaii in 1974. 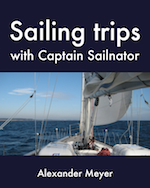 Captain Sailnator: How did you get the idea to live aboard a sailboat and to start cruising? Chuck: I began to dream of cruising the Pacific in the early 60’s after watching a popular TV program called “Adventures in Paradise”, the story of Captain Adam Troy of the 82 foot schooner “Tiki”. The basic plot was of Adam Troy sailing around the South Pacific in search of cargo, passengers and adventure. If you never saw the show you missed a real treat. Captain Sailnator: But a dream does not make a sailor yet? What was the next step? Laura: Many years later while Chuck was recovering from knee surgery at Tripler Army Medical Center in Hawaii. He noticed the boats sailing on the ocean outside his window and remembered the dream. With time on his hands and access to a library he started researching; Hiscock, the Pardeys, Tristan Jones, Joshua Slocum and anything else about cruising he could get his hands on and resolving someday to live aboard a forty foot ketch and go cruising just like Captain Adam Troy. Captain Sailnator: How did it go on? Chuck: Now out of the Army for ten years and with a good job in Honolulu, I started looking for a boat. I had a small inheritance but not enough for a forty foot ketch in seaworthy condition. A friend of my boss got tired of listening to me talk about my dream of sailing and said to me one day “Why don’t you buy my boat?”. “What kind of boat is it.” I asked. “An Albin Vega 27” was the answer and the price was just right for my budget. “But it’s too small.” I complained. “Nonsense!” he replied. He was right. I moved aboard on April 1st 1990.” When I bought the boat from Rick Monteverde and moved aboard she was more or less in original factory condition. Captain Sailnator: So when entered the crew the boat? 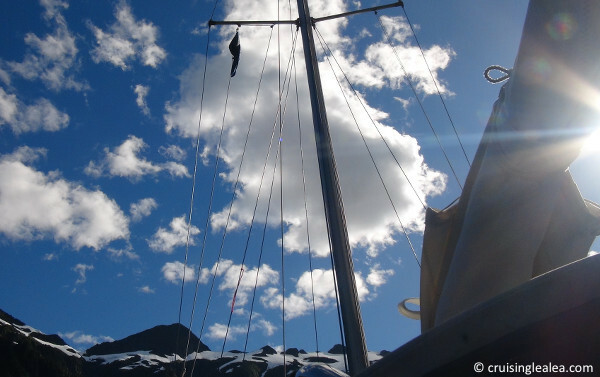 Laura: I moved aboard in 1996 as First Mate and after doing some reading of my own we spent the next three years planning and we decided that although Lealea was only 27′ and considered small by today’s cruising standards we wouldn’t “Need” a forty foot ketch to live our dream so we should save our money and just go. Captain Sailnator: So you did not start overnight. How did you prepare yourself for the big adventure? Chuck: Living aboard and working full time in Honolulu gave us little time to do much daysailing but vacation days were taken for the occasional week long excursion to outer islands, Thanksgiving anchored at Lono Harbor in Molokai, a club race in Kauai. We gained valuable sailing experience on our honeymoon aboard HMB Endeavour on a partial leg of it’s round the world voyage, from Vancouver to Hawaii in 1999. Over the years the “Must do list” to get the boat ready grew shorter and I decided it was time to retire. My last day of work was April, 30th of 2007 and May 1st Lealea was hauled out to begin her final re-fit before crossing the Pacific for the first time. Belongings were sorted, vehicles were sold and in a whirlwind of activity the boat was gotten ready. Captain Sailnator: So when did you start your first passage? Laura: We departed the Ala Wai Harbor on May 26, 2007, even to this day there is still some mis-understanding on that. The passage had been estimated to take 30-45 days and my mother had been instructed not to become alarmed unless she heard from the Coast Guard. I can say about our first trip: We both knew Chuck was prone to getting seasick but neither of us expected it would last as long as it did. Chuck got seasick the instant Lealea passed the channel markers exiting the Ala Wai and was continually seasick for the next 23 days. 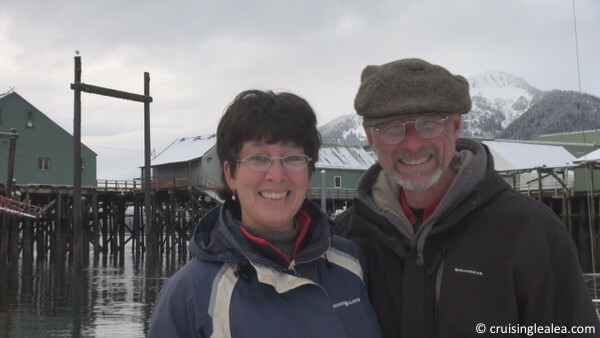 Initially slowing down to accommodate a sick Captain then being challenged by a rigging failure at the halfway point we found ourselves arriving at Neah Bay, Washington after 55 days at sea, nearly 20 days overdue. Yes, my Mom had become alarmed. Captain Sailnator: What did you do after reaching the USA? Chuck: Arriving in Washington with a boat needing to be re rigged and having gained even more open ocean experience we decided to haul Lealea out in Port Townsend, Washington for repairs and upgrades. Laura got a part time job at the local West Marine and work on the boat began again. The moisture accumulated in the boat during the crossing had caused damage to some of the interior woodwork along with a boat load of mold. We decided to replace a portion of the interior, add a dodger and completely re-rig the boat. We hauled out the beginning of August 2007 and dropped back in the water on December 31st, 2007. We lived aboard the whole time. Being the dead of winter with limited cruising options and having a cruising kitty that needed replenishing Laura took another position with West Marine at their Express store in Friday Harbor, Washington. And after completing a one year contract we departed to begin cruising in the Pacific Northwest. Captain Sailnator: And then the plan was to cruise in warmer regions? Laura: Yes! In September of 2010 we headed out the Straight of Juan de Fuca and turned South for San Diego. Nothing about the trip went according to “Plan” and we found ourselves spending the winter in San Francisco instead of San Diego. I, once again, took a position with West Marine to add finances back into the kitty. When Spring of 2011 arrived Lealea sailed under the Golden Gate Bridge and set a course back to Hawaii where we wintered over and cruised the Hawaiian Islands until it was time to set sail for our next destination: Sitka, Alaska. 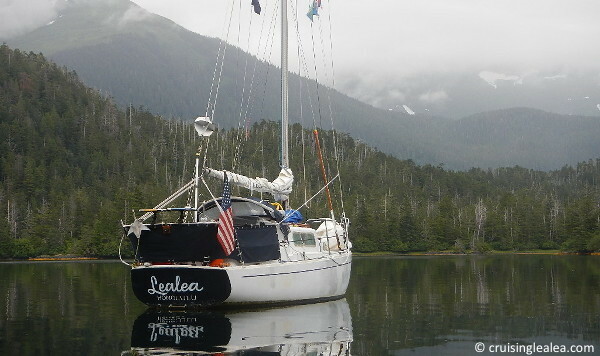 Chuck: Lealea has now been cruising S.E Alaska for the last several years and is currently moored in Petersburg, Alaska. I have been volunteering my time at the local community radio Station, KFSK, and produce a weekly radio program bringing Island Music to the residents of Mitkof Island. Laura has been assisting Dr. Ken Hill of Waterways Veterinary Clinic aboard the Veterinary Vessel Hallie which brings veterinary care to remote Alaskan communities that are only accessible by boat or float plane. Once again it is time for a re fit that will entail a new interior designed to reduce weight and achieve more storage and living space, new rigging and exterior paint. Work has begun and is expected to be complete this Spring. Captain Sailnator: I recognized that you show the refit in detail on your youtube-channel? Chuck: True! We started a new series detailing Lealea’s third refit. And all of Lealea’s passages are chronicled in daily logs and can be found on our YouTube Channel – Cruising Lealea; Honolulu-The Beginning, Leaving Hawaii-our First Long Voyage, Sailing the Pacific Coast, Sailing Back to Hawaii, Cruising in Hawaii, Sailing to Alaska, Cruising in Alaska plus additional videos about cooking aboard, voyage planning and preparation and cost. For more insight into the cruising life visit our website Cruising Lealea or to simply give advice visit our blog found in The Logbook which dates back to 2007 when our journey began. 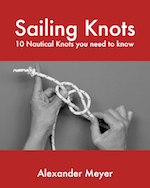 Visit The Captain’s Notebook where Chuck writes down his thoughts, notes and lessons learned about cruising, sailing and boat maintenance or open the First Mate’s Journal and read of Lealea’s voyages in Laura’s daily logs. Click into The Galley and find seagoing recipes, get ideas on provisioning and budgeting or learn more about eating healthy without refrigeration.